After two weeks away from competition, athletes revved their engines in Lahti, Finland for an individual 1.6-kilometer freestyle sprint, one of the final stops on the way to the World Championships. 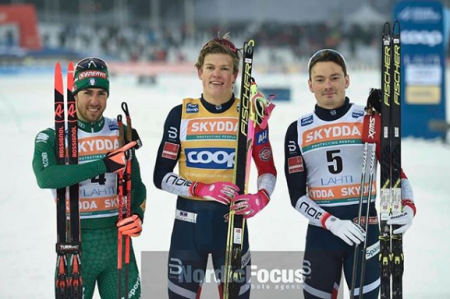 After a string of what he deemed “bad luck” in the first sprint races of the season in Ruka and Lillehammer, Norway’s Johannes Høsflot Klæbo came into the weekend with momentum from winning the last four individual sprints. Klæbo also arrived in Lahti on the brink of what could be a historic milestone; a win could advance him from possessing the joint-third most victories, tied with his opponent Federico Pellegrino of Italy with 12 each, to the joint-second most, tied with Ola Vigen Hattestad of Norway who retired in 2016. 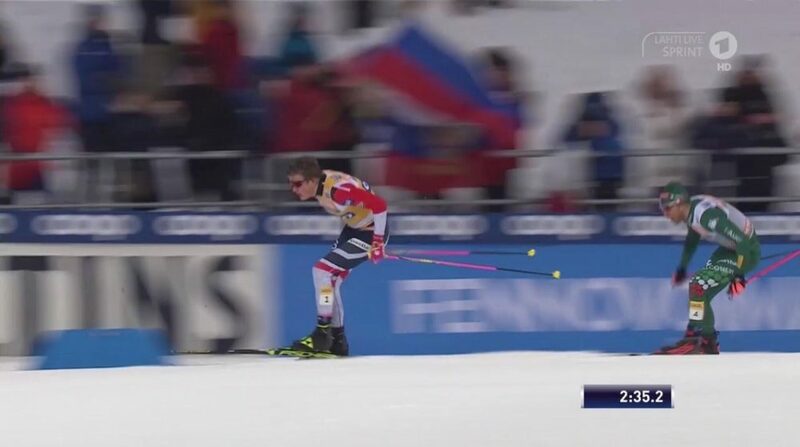 As a penalty for obstruction kept him from advancing from the quarterfinals in Dresden, Pellegrino has not had an opportunity to move ahead of Klæbo since they last met in the final in Val Mustair during the Tour de Ski. 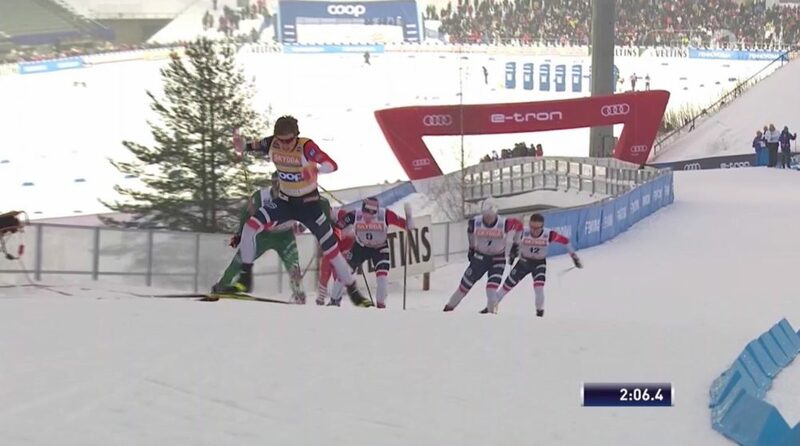 In that event, Pellegrino challenged the Norwegian in both the semi and the final, but could not quite overtake him. Today in Lahti proved to play out in an eerily similar fashion. Both men skied well in the qualifying round, with Klæbo taking the lead with a solid gap, finishing in 2:49.77, followed by his teammate Håvard Solås Taugbøl (+4.15), Joni Maeki of Finland in third (+4.35), Pellegrino in fourth (+4.36), and Finn Hågen Krogh of Norway in fifth (+4.40). Conditions in Lahti were reportedly fast and a bit wet. Temperatures hovered around freezing with some freezing rain lightly peppering the course throughout the day. This stability in the weather and on the tracks kept the playing field fair as the athletes sprinted through the heats. In the quarterfinals, Klæbo and Pellegrino went one-two in heat one, advancing into the first heat of the semi-finals. This first semi proved to be the faster of the two. The Norwegian again took the win in 2:49.84, with his teammate Eirik Brandsdal close on his tails. Gleb Retivykh and Pellegrino, who finished in third and fourth, respectively, advanced as lucky losers. Less than one second separated the six men in the heat, and all of the men skied faster than those in the second heat. In the second semi-final heat, Krogh finished first in 2:50.98, followed by his teammate, Emil Iversen, making it a final of four Norwegians, an Italian, and a Russian. As the men charged out of the gate in the final round, Retivykh led the pack, with the other men jockeying for position behind him. Per usual, Klæbo began to surge on the climbs, using them as his opportunity to move to the front of the pack. The second half of the course featured a steady climb with a steeper punch at the end before sending the athletes down and around a turn into the stadium. On this climb, Klæbo set the pace, trying to slowly pull away from the group. But Pellegrino was not ready to let him go. The Italian crested the hill just behind and as the two men tucked into the downhill, a small gap was created before the next skier back. Pellegrino tried to position himself on the inside of the final turn to get in front of his opponent, but he could not quite make his move. Klæbo was still in front heading into the final straight with Pellegrino nipping at his heels. Krough, who closed the gap they had created was also in the hunt, chasing the leaders to the line. The two kept the pressure on Klæbo, giving him no opportunity to risk his position with an early finish line celebration, but they were not able to surpass him. Klæbo earned his 13th World Cup Victory, stopping the clock at 2:52.06, his ninth win out of the last 13 individual sprint races. 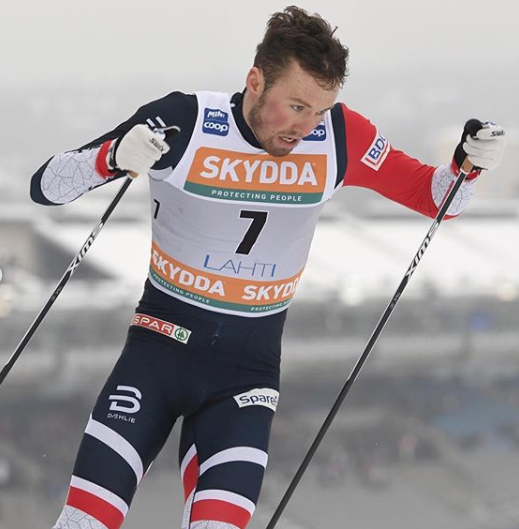 Pellegrino took second (+0.30), followed by Krogh in third (+0.61), Brandsdal in fourth (+1.31), Iversen in sixth (+1.75), and Retivykh in sixth (+2.08). No North American men qualified for the heats, which came as a surprise to both the athletes and the coaches. Logan Hanneman (APU) posted the fastest qualifying time for the U.S. placing 32nd overall after missing the heats by .22 seconds. Simi Hamilton (USST) finished 36th overall, and Erik Bjornsen (USST) 42nd. Though he was offered starts in both Period 1 and 3, it is Hanneman’s first time racing internationally this season. The APU skier was the top qualifier in the 1.3 k skate at US Nationals, placing second in the final. He also took third in the final in the classic sprint. When Hanneman competed in the sprint in Lahti last March, he placed 49th overall. As illness kept him from racing in the city sprints in Dresden, it has been over a month since Hamilton last put on a race bib. During his time away from the World Cup, Hamilton traveled back to the U.S. to spend some time back in Vermont, where on top of training, he proposed to his girlfriend, Sophie Caldwell. Hamilton returned to Europe two weeks ago to participate in the Vålådalen camp. While the camp went well for him, the aforementioned temperatures prevented Hamilton from putting in those hard training efforts, but there is still time before Seefeld to capitalize on his fitness. Despite his disappointment in his own performance, the day had a silver lining for Hamilton, as Caldwell landed on the podium with a second place finish in the women’s 1.4k sprint. Hamilton has a second chance to find his top gears when racing continues tomorrow during the classic team sprint where he will line up with Bjornsen. The team sprint will be held on the same course as the individual race today, a change from past years of the Lahti Ski Games.